UFO SIGHTINGS DAILY: UFO Over Beach Of Puerto Vallarta, Mexico Reported This Week, UFO Sighting News. 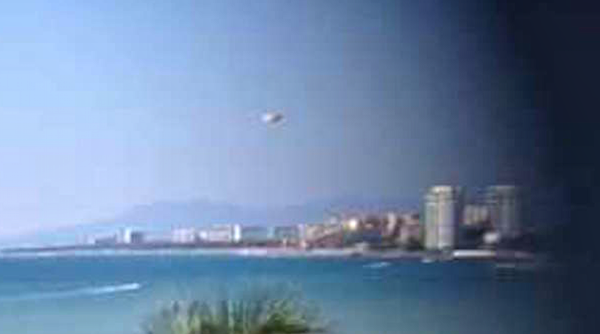 UFO Over Beach Of Puerto Vallarta, Mexico Reported This Week, UFO Sighting News. Date of sighting: Dec 14, 2014, but submitted this week. The report came in the week and shows a UFO in the far upper right corner of the photo...don't make me say that twice...focus guys. UFOs are frequently seen over Mexico and are believe to enter underground bases in the mountains and below many of Mexico's volcanos. Even the ancient Aztecs said that the gods entered and left from the mouth of Mexico's volcanos....but we all know those were UFOs. Picture taken in puerto vallarta, mexico in December 2014 during the daylight in between dec 14 to 21. Vacationing at Hilton resort Puerto vallarta. Looked back at picture today April 20th 2016 and noticed strange object in photo. Never noticed it before.